Here at Natural Sleep Mattress of Atlanta, we feature the world’s most luxurious and natural beds – including certified organic latex mattresses and customizable mattresses. We’re committed to selling the best mattresses in Atlanta, which is why we wanted to bring these handcrafted Posh and Lavish mattresses to Atlanta. We were impressed by the engineering that goes into every Posh+Lavish mattress – and by the fact that each one of their luxurious mattresses is built by hand in California by a team of skilled craftsmen. Natural Sleep Mattress is the headquarters for Atlanta’s luxury beds, so we are excited about being able to offer these exceptional mattresses to you. The expert design of these mattresses takes into account your spine’s need for long-lasting support as well as your muscles’ need to relax during the night, so that you can sleep better and live well. Because of the exceptional care that goes into their creation, all Posh + Lavish mattresses come with either a 10- or 20-year warranty. The mattresses are made with naturally infused materials such as long-lasting and uplifting latex rubber. The latex used in Posh and Lavish mattresses is Oeko-Tex certified, which means it has gone through an independent testing and certification system for raw, semi-finished, and finished textile products at all processing levels. The goal of the OekoTex standard is to enable consumers and companies to protect our planet by making responsible decisions based on a commitment to high social, ethical and environmental standards. Each mattress is assembled using certified, non-toxic, water-based glue. A generous amount of all-natural, long-fiber wool nestled between two layers of all-natural cotton encase each mattress. The two materials can help warm you when you are cold. They can also help you keep your cool you when you get warm during the night. And both materials wick moisture from your body while you sleep. Posh+Lavish mattresses are free of boric acid and antimony. 25% of all of the company’s profits are donated to CURE International. CURE is a network of charitable hospitals and programs that provide healing to children with treatable conditions such as clubfoot, bowed legs, cleft lip, and hydrocephalus. 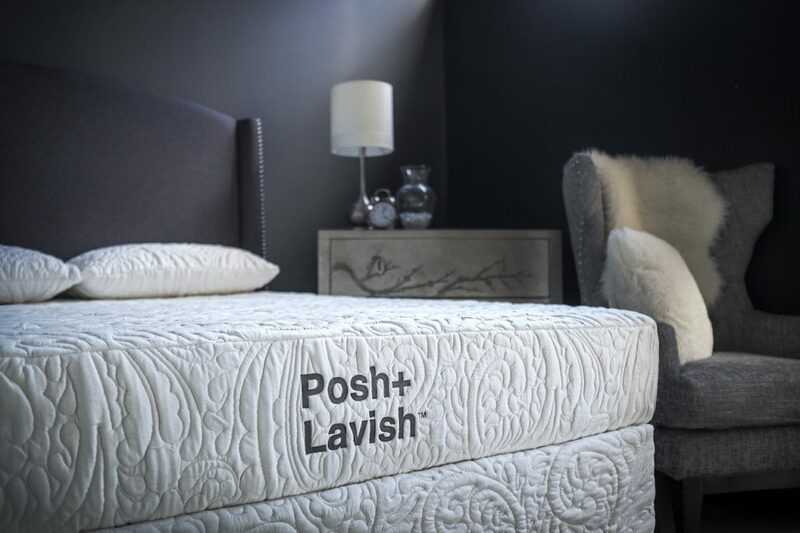 If you would like to learn more about Posh+Lavish mattresses, we invite you to visit Natural Sleep Mattress of Atlanta at our Buckhead location on Piedmont Road NE. We have created a shopping experience that is worthy of Atlanta’s luxury beds. Our showroom provides privacy, soft music and comfortable lighting so you can relax and truly get an idea of how each of the luxury mattresses we sell will feel once you get it home. For more information, call 404-998-5212 to speak with one of the sleep experts at our Atlanta luxury mattress store.